“Working in my dry-stone lined bothy in the garden, with views over the hills, I am frequently inspired by this landscape which is reflected in my mosaics. Flowers in abundance feature in the majority of my exhibition pieces, as well as in private commissions. While many of my pieces are considered ‘decorative art’, I also enjoy making mosaics with a more practical purpose such as mirrors, table tops and garden items. In producing my mosaics, I aim to be true to myself and my interest in recycling and sustainability by incorporating many recycled materials, including those representing me and my home town of Crieff, Perthshire (Crieff Pottery whisky jugs; remnants from a local fused glass artist) or pieces donated to me by friends and family similar to a traditional patchwork concept. I also use wine bottle glass and broken car windows amongst other salvaged materials. 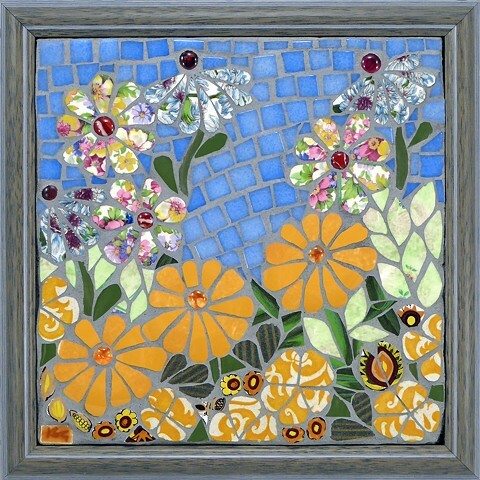 The surface used for many of my mosaics originates from discarded kitchen units. Recycled materials stimulate many of my ideas in mosaic pieces that I have done, and as a consequence my "bothy in the garden" is now filling up fast with china, glass and decorative ceramic ornaments and overspilling into the garden.